Consumer Electronic Show (Las Vegas, NV) Scarlet Rhapsody enters the grid. Let the games begin. Animation on Display (San Francisco, CA) . Food, food, and more food to make genki girls happy. We Heart Japan (Los Angeles, CA) Stateside anime industry folks host a charity art auction to support victims of the disaster. Anime Conji (San Diego, CA) Comic Con is not the only nerd party in town. Make way for big eyes and small mouths. Long Beach Comic Expo (Long Beach, CA) We all won the game because we are made of 7331Sauce. Anime Central (Rosemont, IL) Draw a circle around the con and call it ACen! Fanime Con (San Jose, CA) Summer days drifting away to uh-oh Fanime nights! We'll tell you more. Bot Con (Pasadena, CA) A convention that is more than meets the eye! Electronic Entertainment Expo (Los Angeles, CA) Gamers delight! Jared tests out upcoming video games. Traveling, is Scarlet Rhapsody's division of anime convention reporting. Over the past several years, we have been covering anime conventions, electronic shows, and fan gatherings from around the West Coast. We occassionally attend conventions in the MidWest or on the eastern seaboard. Traveling is a collection of interviews, photos, highlights, lowlights, video, and memories share at conventions. Each report has a different personality to it as no two conventions are the same. We truly hope you enjoy reading our convention reports. This is our report archive for 2011. 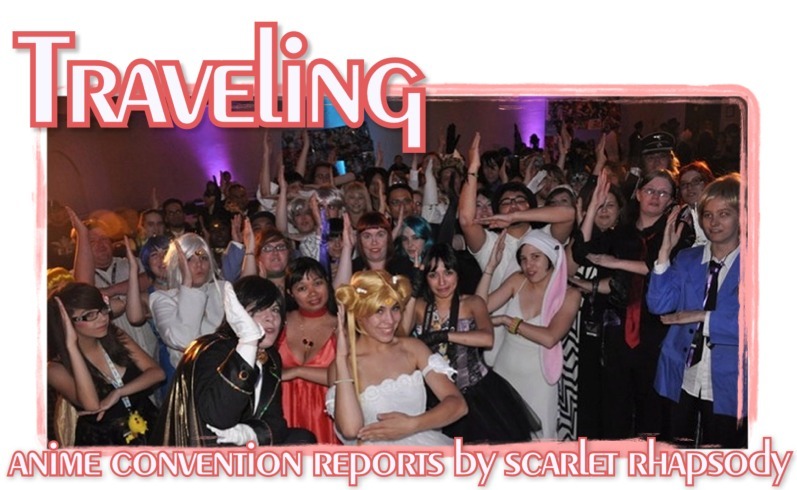 Though we no longer go by the name "Traveling," this is a collection of reports of anime convention past. During 2011, we attended many local events in the Los Angeles area. For the first time, we attended CES in Las Vegas. We also attended not one, but two Bay Area events. This was also the year of the increasing number of comic book and popular media events in the LA area. Long Beach Comic Con and Comikaze are beginning to show power and prominence among Los Angelino geeks. We also went to Anime Conji for the very first time and performed a live podcast. Speaking of programming, we also begun our first time touring conventions with our Moon Prism Poptarts panel. Moon Prism Poptarts details the history of Sailor Moon in North America. This educational panel talks about what it was like to Westernize a Japanese anime in the 90s. This also covered the politics of censorship and morality. Moon Prism Poptarts became a huge success and we hope to see it do well in the future. 2011 was also the year Japan faced a terrible natural disaster in the spring. Many anime conventions got together to help a worthy cause. Groups like We Heart Japan were formed so that members of the American anime industry can work with the fans to provide to the relief. 2011 was a very good year and we hope for more awesome times in 2012. That is, if the world doesn't end. Scarlet Rhapsody Says! Anime Expo (Los Angeles, CA) The biggest anime convention in the US keeps getting bigger and better. AM2 (Anaheim,CA) For love or for spite? Julia and Caitlin visit the convention that's generated buzz in the anime community. Nisei Week (Los Angeles, CA) Honoring our city's past and giving back to the community. Anime Los Angeles Picnic (Rancho Simi Valley , CA) A summer picnic just before school starts up again. Pass the lemonade! Los Angeles Cherry Blossom Festival (Los Angeles, CA) Blossoms in the fall. The cultural event returns. Long Beach Comic Con (Long Beach, CA) The one event you'll find zombies and superheroes gallavanting. Comikaze Expo (Los Angeles, CA) Torchwood investigates the weird and the geek in downtown Los Angeles - and not for Miracle Day! Pacific Media Expo (Los Angeles, CA) One more shot for us, another around. Please fill up my con, don't mess around. Bent Con (Los Angeles, CA) Bears over bishies. ©2000-2011 Traveling is a Scarlet Rhapsody property. Design and layout by Victoria. Please contact via email (staff @ scarlet-rhapsody.com) if you have any questions or comments.